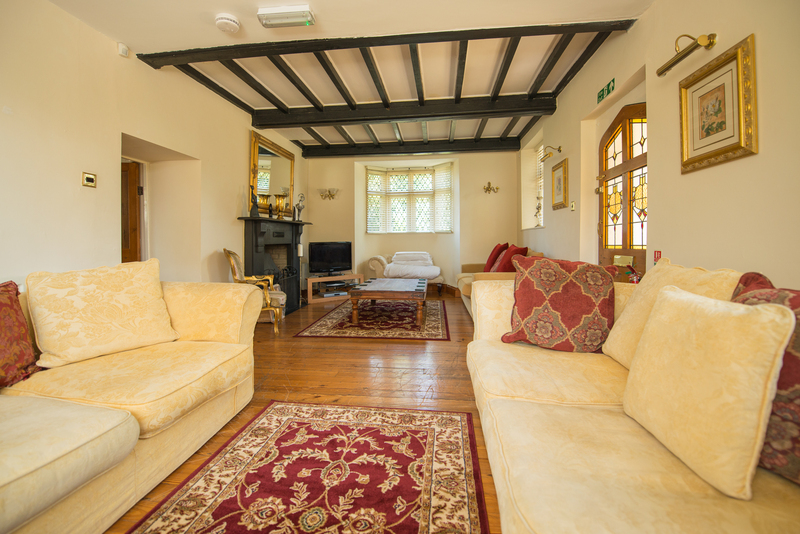 Sleeping up to 25 and situated in the grounds of 17th century Hensol Castle, in an idyllic countryside setting. To book Hafod Lodge there is an age restriction of 21 and over and a minimum booking size of 15 people on the weekends only. 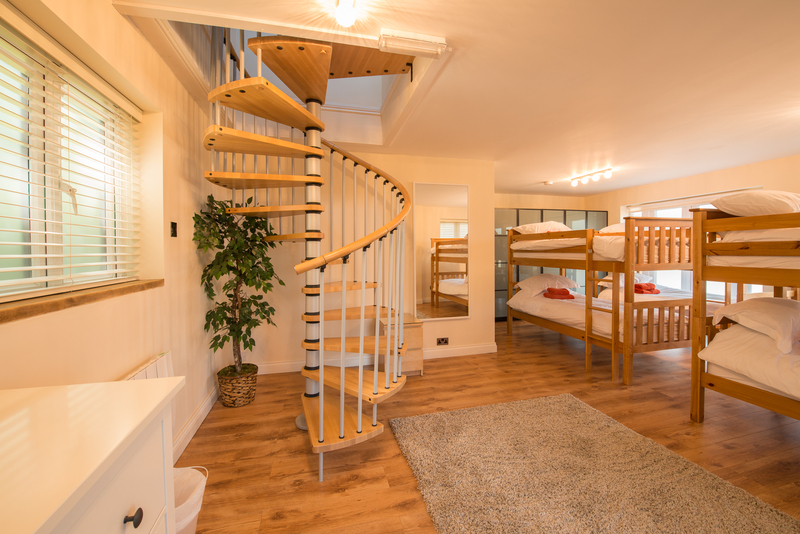 The Lodge sleeps up to 25 people; this includes 15 people sleeping in Hafod Lodge and 10 people sleeping in the detached bunkroom within the private grounds. 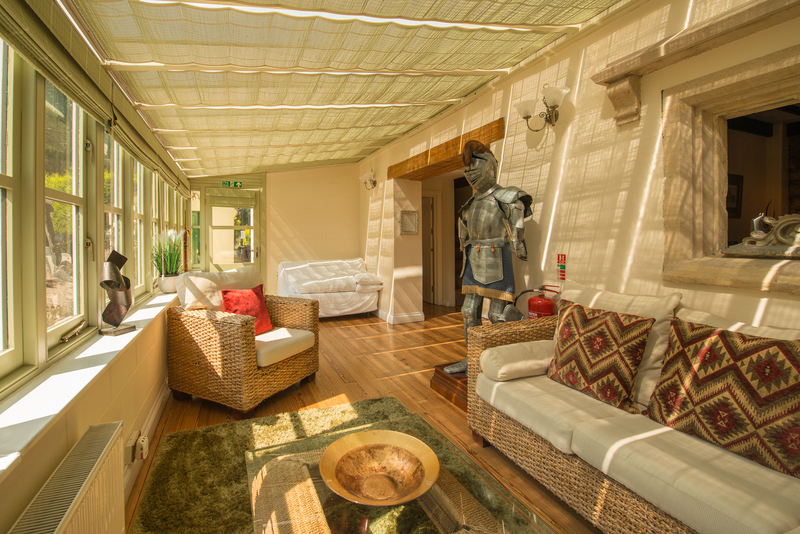 This 6 bedroom lodge with its own outdoor heated swimming pool and 10 seat hot tub, is situated in the grounds of 17th century Hensol Castle, in an idyllic countryside setting. 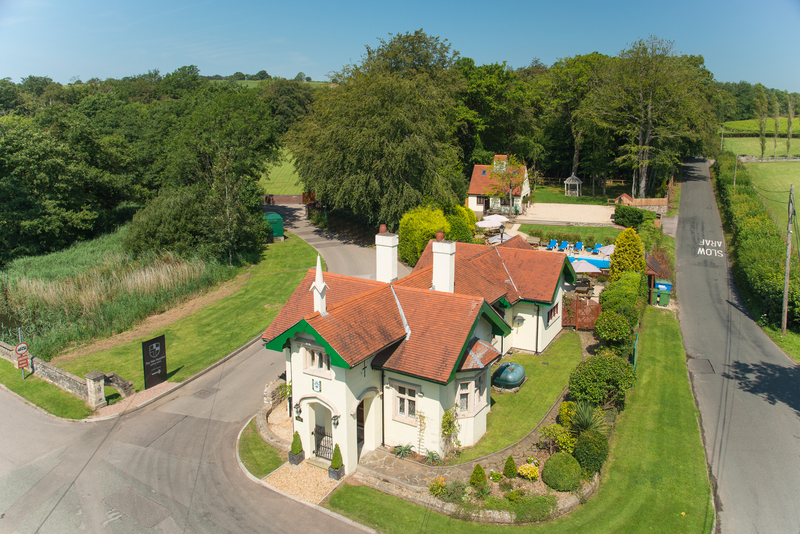 Just 5 minutes from The Vale of Glamorgan golf course and hotel. 20 minutes from Cardiff City Centre. Having enjoyed the virtual tour, why not see this fabulous holiday retreat You-Tube video below. 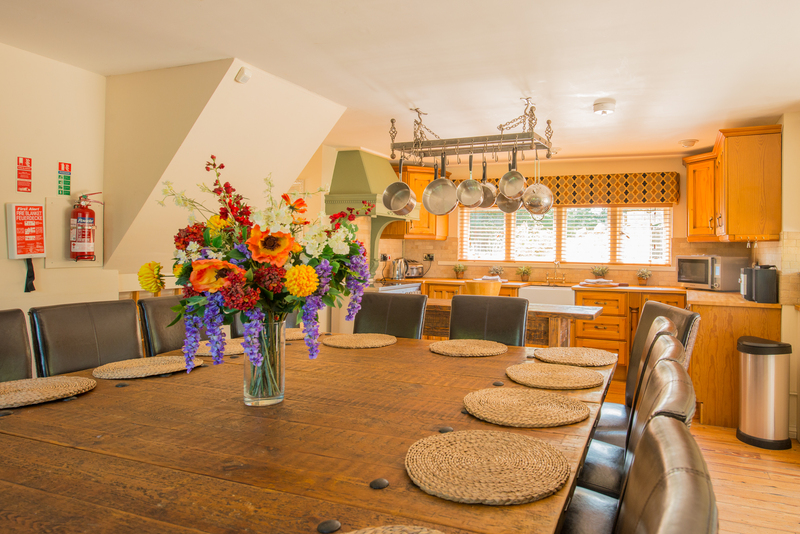 Country style kitchen with solid wood table to sit up to 20 people. Island work station. American fridge/freezer, dishwasher & double-range cooker. Fully equipped kitchen with microwave and all appliances. Patio doors to pool area, gardens and hot tub. Lounge with beamed ceilings and open wood fireplace. 3 piece suite and 2 Victorian chairs. 42" TV with Sky and DVD. Bedroom 1 - large master bedroom with 5 single beds, own staircase. Sink and shower en suite. 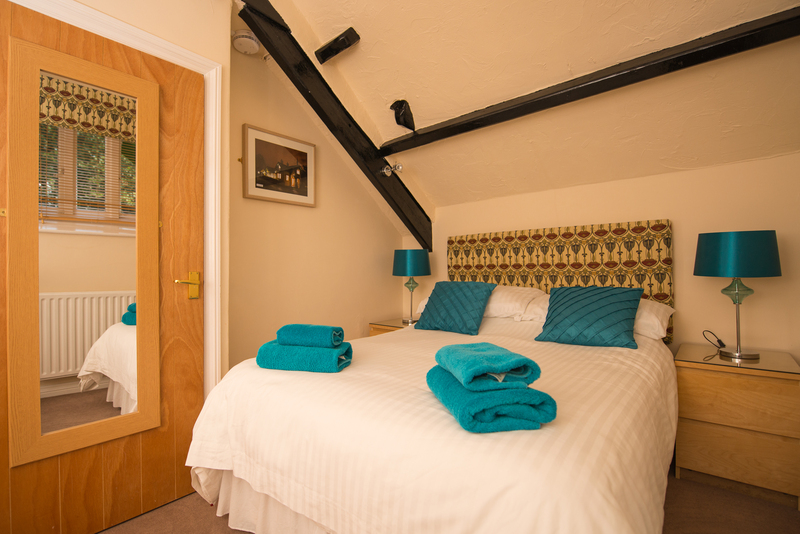 Bedrooms 2, 3 and 4 - all double beds, with the option of 2 double bed settees. Bathroom 1 - downstairs with toilet, basin, and large shower. Bathroom 2 - upstairs with toilet, basin, bath and shower. Bathroom 3 - 2 shower cubicles with toilet and basin. Own private heated outdoor swimming pool and 10 seat hot tub which is fenced off for safety. Large patio area around pool-side. Outdoor/pool furniture including barbecue. 5 minutes from Vale of Glamorgan hotel which features 2 golf courses with one of these being a championship course. The resort includes a health spa, bar and restaurant. 2 minutes from junction 34 on M4, and 20 minutes from Cardiff City Centre by car. Minibuses available on request from as little as £10 per person return. Cancellation and prepayment policies vary according to property. Please email to us to learn more about this. I stayed at this property with a large group last month for a week as a birthday celebration. This group included 10 adults, 3 teenagers and 5 young children. We arrived at the lodge and were straight away amazed at the beauty of the surroundings. We were then greeted by a very helpful lady who showed us into the property. The pool was a massive bonus as it kept the kids entertained for hours on end. Us men played on the local golf course which was brilliant, we were picked up by a golf buggy that then dropped us off to the course which is only 2 minutes away. We also all went quad biking which everybody enjoyed. Cardiff was approximately 15 minutes away and it is a very good city that has a vibrant atmosphere in both the night and day although I am from Cardiff but others in the group were from London and they really enjoyed the city. The Lodge was very clean and was very spacious for all of us. The garden is beautiful and the patio was ideal for a barbecue which we had on a few nights. I would highly recommend this property for large groups, stag/hen parties and families as there is something to do for everyone. The pictures of this lodge do not do it justice. On arrival, every one of our party of 12 was incredibly impressed by this lodge. Plenty of space to socialise in the kitchen (as tends to be the norm in these situations) – though perhaps a couple more dining chairs would have been useful. The lounge was spacious and all of the bedrooms were very clean and comfortable. There was plenty of sleeping space and everyone had a good night’s sleep. The taxi ride into Cardiff was about £40 per group of 6 which didn’t seem too bad. Overall, excellent, and we will be back! We have family nearby and were able to have the most amazing Birthday and Christmas holiday in this beautiful country home. It is a very special place and we hope to return year after year. It was decorated beautifully for the holidays (complete with a gorgeous Christmas tree) – travelling from the US, this made it an amazing spot for the holidays. We can’t say enough about how gracious the management was; meeting us for check-in and helping us locate the missing car keys a 1/2 hour after check-out. This is a very special spot, close enough to Cardiff but rural enough to make you feel like you are the only one out there. Mary was there when we arrived and gave a great overview of the area and the lodge itself. What a lovely place for a family holiday, everyone had an amazing time, we took 3 young children with us who thoroughly enjoyed themselves, and although the weather was not great we still managed to make full use of the pool and hot tub, the lodge was fully equip with everything we needed, we will definitely be returning in the future, wonderful!! Our large family group of 16 (8 adults & 8 children) recently stayed at Hafod Lodge for 5 nights. We absolutely loved the character of the house ! We had plenty of room to accommodate everyone and the kids were well entertained with the pool and spa. Mary was extremely helpful with directions to the local amenities (only a short 5 min drive away to a very large supermarket). 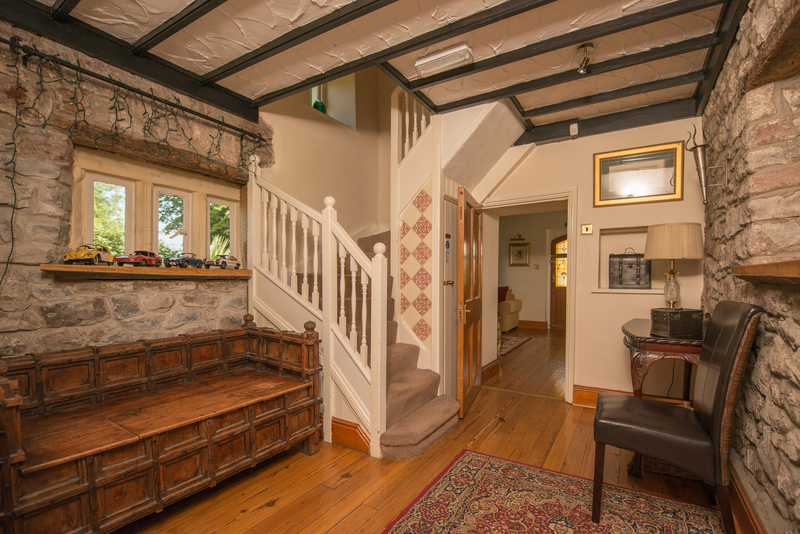 The house is well located close to Cardiff for sightseeing, but is also a great retreat away from the city. We would recommend Hafod Lodge to anyone seeking a relaxing stay in Wales and hopefully will return in the future. It was the perfect place for a group of 9 to have a relaxing time whilst making sure to stay up late and socialise in the pool and hot tub into the wee hours of the morning. The house is well stocked and we cooked some amazing meals and made sure to make use of the BBQ too. We definitely recommend it. The lady was lovely and are thinking of coming again maybe next year. 17 of us stayed at Hafod Lodge for 1 week, as our son was getting married at a venue close by. It is a great property, ideal for a large family group; clean, bright and spacious, set in attractive grounds. The pool (which was used everyday) was a real bonus. The location was perfect for exploring Cardiff and the surrounding areas. 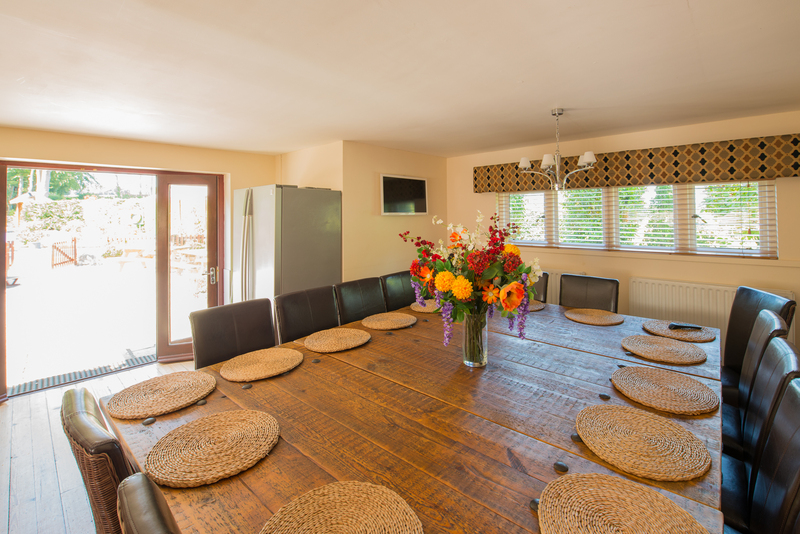 This house is stunning with plenty of room for everyone without getting on top of each other, we had it for a weekend for my hen party and the huge kitchen table was a perfect eating area with room for us all. The pool and hot tub area made the stay and a fab place to have a few wines, Before during and after our stay the property managers were extremely helpful and well organised. It’s pretty secluded so we were able to relax without worrying about disturbing anyone, they helped us organise a mini bus into Cardiff for the night at a very good price and we also had lunch at the nearby Llanaerch vineyard which is really worth a visit. Cardiff is a city of surprises which is why it is one of the UK's most popular visitor destinations. The Capital city of Wales is already well known for its sporting, artistic and maritime traditions and more and more people are discovering everything else it's got to offer. Cardiff boasts all the tourist attractions, cultural and leisure facilities that you would expect in a modern capital city - and all so easily accessible. In the city centre there is a magnificent range of shopping opportunities, all just a stone's throw away from a fairytale historic castle, the famous Millennium Stadium and acres of lush parkland. Just a short walk or ride away is Cardiff Bay, where there is a fantastic array of mouthwatering waterfront restaurants. You could also take in one of the many tourist attractions or enjoy a show at the Wales Millennium Centre. As well as offering a whole host of things to see and do within the city, Cardiff makes a great base for visiting the Vale of Glamorgan. Good road and rail links across the region mean that visitors can combine a stimulating city break with the rural scenery on Cardiff's doorstep.